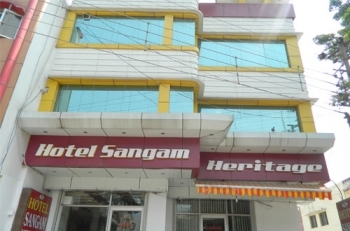 Hotel Sangam Heritage is a budget hotel ideally located in the outskirts of Haridwar City of Uttarakhand. The hotel comprises 12 well appointed rooms with all basic amenities in it. Rooms are well spacious and well maintained with all neccessary comforts. The hotel has a restaurant as well serving vegetarian mouth watering dishes. The hotel offers a vide variety of services to their guest with 24 x 7 hrs. Guest are always praised by the staff of the hotel. The hotel is conveniently located near the famous Gurukul Kangri Pharmacy at Kankhal, Haridwar. Near by famous tourist attractions are Har Ki Pauri, Mansa Devi Temple, Chandi Devi Temple, Daksh Prajapati Temple, Chilla Wild Life Sanctuary, Bheemgoda Tank, Vaishno Devi Temple, Saptrishi Ashram, Maya Devi Temple, Pawan Dham, Shantikunj Ashram and Sureshwari Devi Temple. Nearest International Airport is at Delhi with the a distance of 214 kms and domestic Airport, Jollygrant Airport at Dehradun with a distance of 38 kms. All 12 rooms of the hotel are well maintained with all modern facilities. Rooms are beauifuly carved out so you can revitalise after a weary day. Rooms are well decorated with all modern facilities and interiors. Along with this every room contains attached bathroom, Private toilets and also Private Balcony from where you can view a wonderful sight of Sun Set at evening. Rooms are fully equipped with modern amenities like Color Tv, Telecom service, etc. The hotel offers a huge centralised air conditioned hall for the restaurant, well furnished and has a beautiful ambience. The restaurant occupies the ground floor of the building. The city being abode of God, the restaurant offers Pure Vegetarian food with the capacity to serve 30 people at a time in 8 separate tables. It serves North Indian and Continental food to the guest. The Breakfast menu includes chole puri, puri bhaji, 2 type of cornflakes, fruit juices, fresh fruits, bread, coffee, tea, toast and many more in their menu. - Children above ten years will be counted as extra person. - All taxes will be charged extra. By Road : Haridwar is well connected through motorable roads. Guest visiting Haridwar by their own vehicle or by hiring Car/ Taxi/Cab then the hotel is at a distance of 170 kms from Delhi, Meerut(60 kms), Muzaffarnagar(60 km) and Roorkee(30 kms). By Air : Dehradun Jollygrant Airport is the nearest airport with a distance of 45 kms from Haridwar. And has continual flights to Delhi. By Train : One can come by train from which the Railway Station is about 4 kms from the hotel.